After nine months, two postponements, and one social media campaign, American Idol’s latest winner, Candice Glover, dropped her debut solo album, “Music Speaks,” on February 18th. The 11-track album highlights the powerful vocals and passionate delivery that not only helped Glover cement her status on Idol, but also garnered an Outstanding New Artist nomination for the 2014 NAACP Image Awards. For her first single, Glover chose the self-love anthem “I Am Beautiful,” which became available for immediate digital download during the American Idol Season Finale where she was crowned champion. Glover has been incredibly vocal about the self-esteem issues that have plagued her throughout her life, and in “I Am Beautiful,” she proudly pushes them to the side. The vibrant chorus encourages anyone that has had similar struggles to proclaim, “When I fall it don’t matter that I’m not perfect/I am beautiful/I’m not alone." As depressing as the lyrics may seem, Glover manages to turn the song into an emblem of her personal strength, rather than a plea for pity. The soaring musical track upholds Glover’s voice and envelops listeners in her sense of warmth. In a much more upbeat vein, Glover collaborated with hip-hop producer Mike Will in “Passenger,” which layers Glover’s rich vocals with a solid background of echoes, loops, and beats engineered by Will. This is the longest track on the album, clocking in over four minutes. The final notable mention is Glover’s cover of The Cure’s “Lovesong,” which closes the album. Though this classic song of unrequited love has been covered by a number of artists, Glover revives the song with beautiful vocal clarity and earnest emotion. It comes as no surprise that “Lovesong” made it onto “Music Speaks,” after her live performance on American Idol left audiences and judges alike in awe. 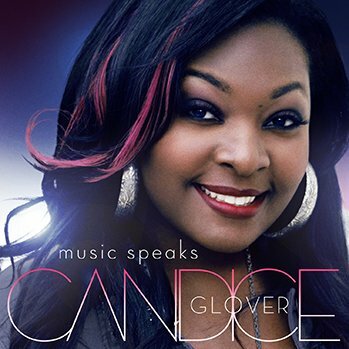 Fans of Candice Glover will be satisfied with “Music Speaks,” as it stays relatively true to the persona she was known for on American Idol. Whether or not she will see major mainstream success is questionable, but she should rest easy knowing her debut album is far more pleasing than not.